Welcome to this week’s edition of Free Curriculum Friday! This week, I’ve teamed up with my friend from Teach Me Joy and she is bringing you an incredible history curriculum resource for FREE for one week only! Check out what she has to say…. We needed something new and different this school year. My son had 2 tough years in a local private school. He was behind in his studies, hated anything to do with learning, and had an all-round bad attitude when it came to school. We decided it would be best to homeschool and I started looking into programs. It was not going to be easy to catch him up and teach him that learning wasn’t all that bad at the same time! It was a daunting task that had to be conquered and I ended up creating the solution myself. I started with something my son was interested in. He enjoyed history and wanted to learn all about different wars. I wanted to be able to direct his learning and give him a hunger and thirst to seek out information on his own. 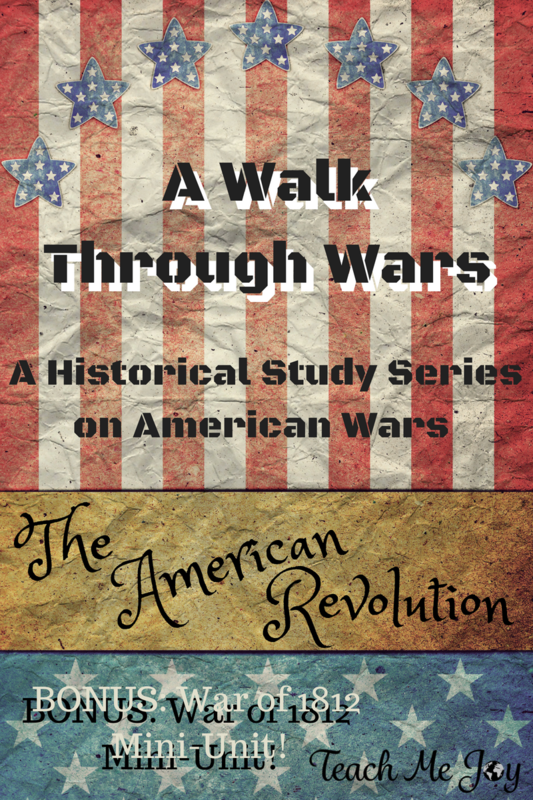 I crafted a series of unit studies using the skills that I wanted him to learn and the Walk Through Wars History Unit Study Series was born! Do you need something that sparks your 4th-8th grader’s interest? Do you need a history program that encourages your student to dig into the facts? Do you need an easy way to teach your middle school student the basics of taking notes, building a bibliography and an outline? Do you want your student to learn different writing skills? Writing projects include writing a research paper, newspaper articles, biographies, or a persuasion paper? Do you want your child to read historical fiction stories and be able to fill out simple book reports? Do you need a creative element that helps solidify student’s learning? If you answered YES to any of these questions, I want to give you the opportunity to try the first unit in Walk Through Wars for FREE! The first unit is The American Revolution. It includes a BONUS mini-unit on the War of 1812. What is included in Unit 1? These units are a fun and exciting way to learn about these crucial junctions in history. They teach students to take responsibility for their learning by guiding them in an easy to follow format. Don’t just take my word for it, try it out yourself! 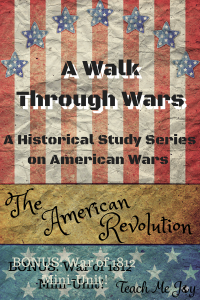 To get your FREE American Revolution + War of 1812 Unit Study, enter your name and email address into the form below! Click Here to see all the Walk Through Wars Units Available! Joy Bryant is the owner of Teach Me Joy, a blog focusing on homeschooling around the world and growing world views. 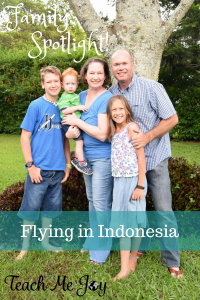 She lives in Papua, Indonesia where her family serves churches, communities, and missionaries in the mountains there with Mission Aviation Fellowship. She is passionate about teaching as well as living life with Joy & Grace! Join the Teach Me Joy community! So disappointed I missed this! Was too busy trying to get one of your other freebies. It does sound like a fantastic study for a hands-on learner! I think it would have been great to try with my high functioning autistic son, it’s really hard to find good hands-on history studies for kinetic learners. I usually end up creating studies myself, with activities I either find or create myself. I’m sure there are quite a few people who are appreciating your generosity.